Cartier has taken its legendary Crash wristwatch, born of a car crash in sixties London, and equipped it with a skeleton movement inside an enlarged, platinum case. The first of a new line of reimagined historical timepieces, the Crash Skeleton is a limited edition of just 67 pieces. 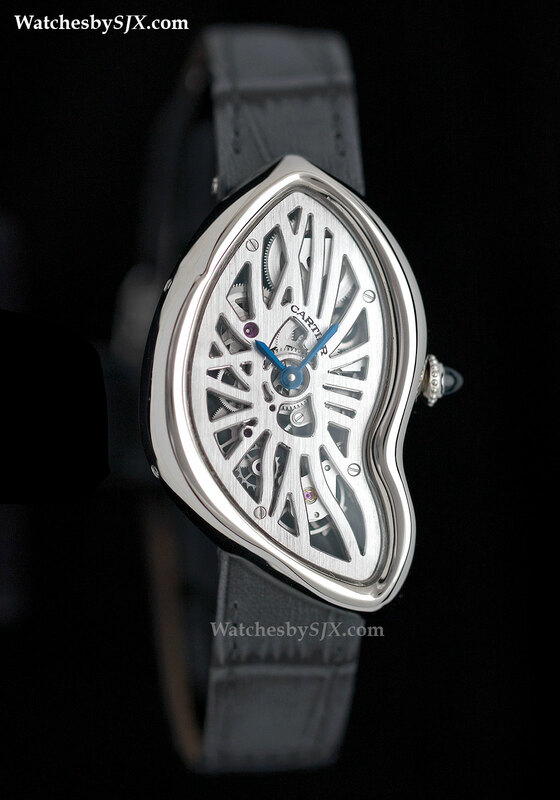 At SIHH 2015 the most gorgeous iteration of the iconic asymmetric Cartier will make it debut. The Crash Skeleton is identical to the classic Crash wristwatch, the Crash Skeleton is slightly larger than the original, while the 9618 MC movement inside has been skeletonised in an appropriately Dali-esque manner to match the case. Legend has it the original Crash was inspired by a ruined timepiece retrieved from a car crash involving an executive at Cartier London. The impact and heat of the Crash turned what had been an Maxi Oval wristwatch into something straight out of a Salvador Dali painting. Since its creation in 1967 the Crash has barely changed. Though several editions have been made, they were largely identical and made in small quantities. The first 1967 model that was in production for about 20 years, followed by a limited edition from 1991, as well as more recent special order watches; the most recent model being the Crash on a bead bracelet. But the look and size of the watch has stayed the same, with Cartier resisting making changes to the design, even for custom orders. 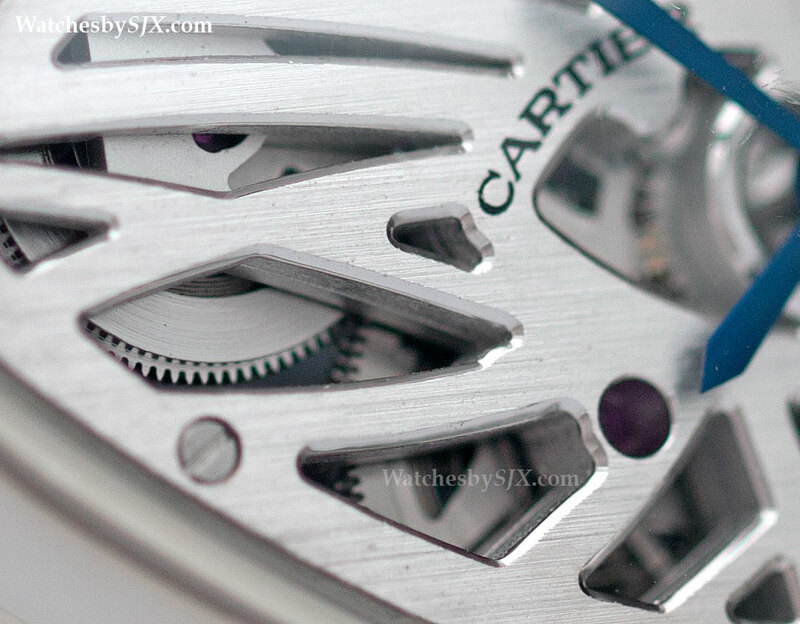 This has made the Crash the most collectible of contemporary production Cartier watches. Now for the first time the Crash is being made as a skeleton timepiece. Though true to the original in shape, the Crash Skeleton is 10% larger, measuring 28.15 mm wide and 45.32 mm long (the regular Crash is approximately 23 mm by 38 mm). Though subtle the increase in size is significant, making the Crash Skeleton suitable for men. The strap, however, is narrow, making the watch seem smaller than it actually is. 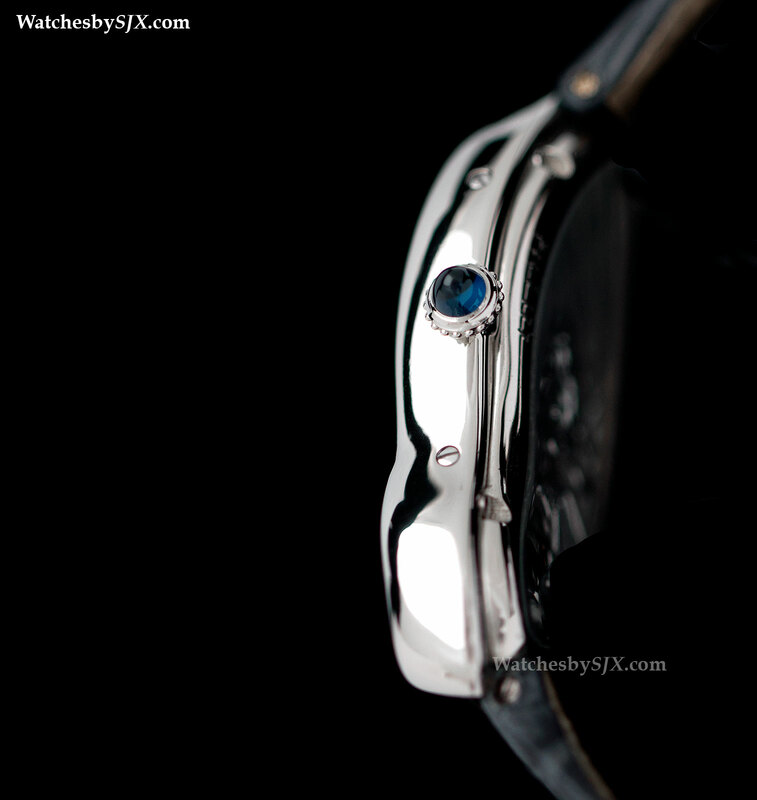 The case is platinum, as is the crown, set with a blue sapphire cabochon. The dense metal gives the watch heft, even though it is modest in size. Importantly, Crash watches in platinum have been rare historically. Platinum cases take more effort to machine, requiring five to ten times as long to manufacture compared with a gold case. 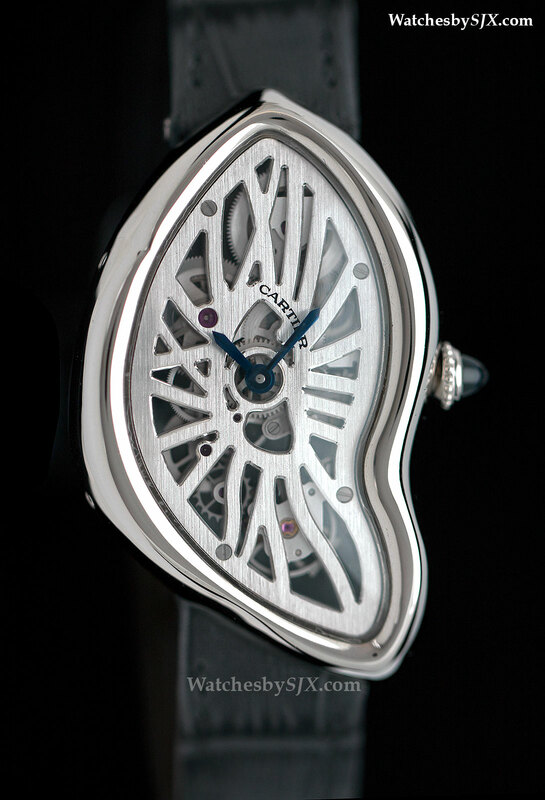 Cartier has done an admirable job in shaping the platinum case in the sinuous lines typical of the Crash. 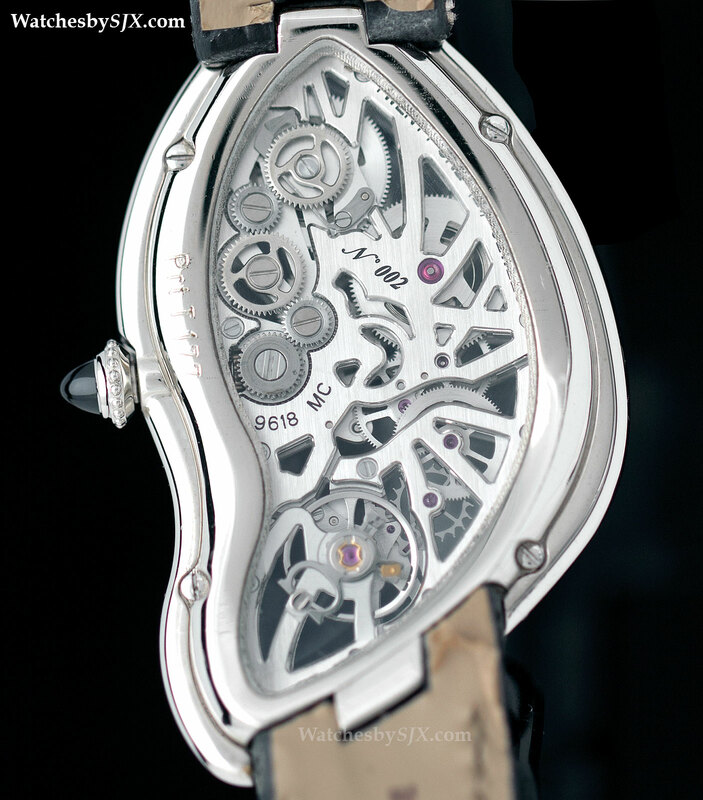 The base plate of the 9618 MC movement inside forms the dial of the watch, having been open-worked to form Roman numerals that are slightly off-kilter. 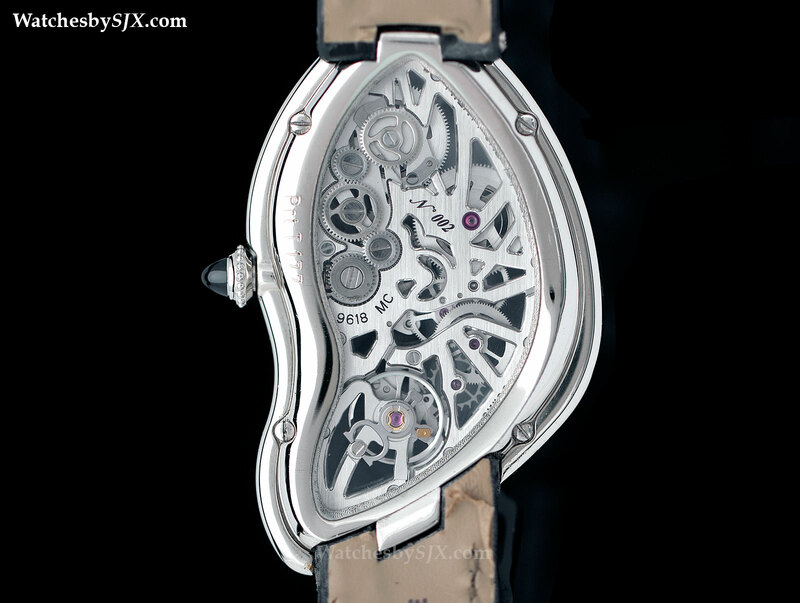 Not only is it skeletonised, the surface of the base plate is gently curved to conform to the shape of the case. The mineral crystal is also curved on two axes, laterally and vertically. The crystal on the rear, however, being flat, is made of sapphire. Based on the skeleton movements found in the Santos and Tank Skeleton watches, the 9618 MC movement is manually wound with a three day power reserve. 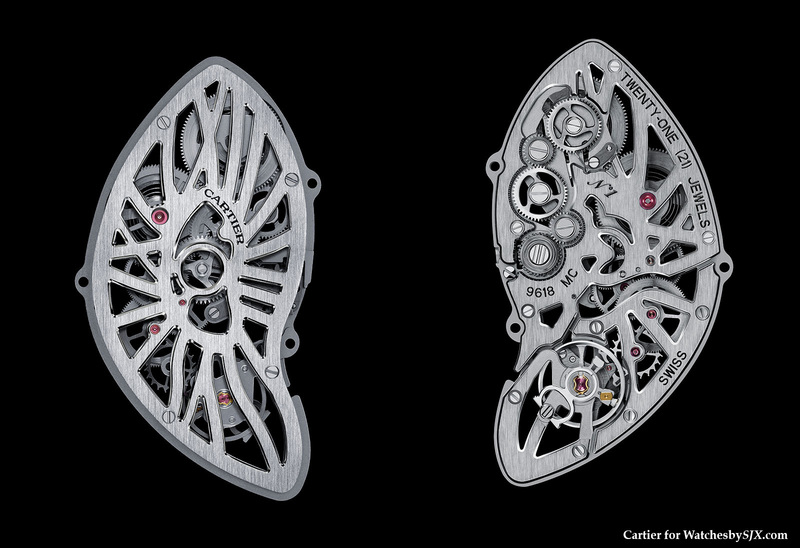 Mechanically the 9618 MC movement is identical to the Cartier’s other time-only skeleton movements, except the gear train and barrels have been rearranged to fit the unusual case shape. Only 67 pieces in platinum will be made, with a retail price of 50,000 euros, equivalent to US$62,800. And there will be another 67 pieces in platinum with diamonds on the bezel priced at 85,000 euros, which works out to US$107,000. Despite the eye watering price, the Crash Skeleton will no doubt sell at a brisk pace. And with only 67 pieces for each version, there will be more buyers than watches. Significantly, the Crash Skeleton is the first in the Fine Watchmaking Heritage line. 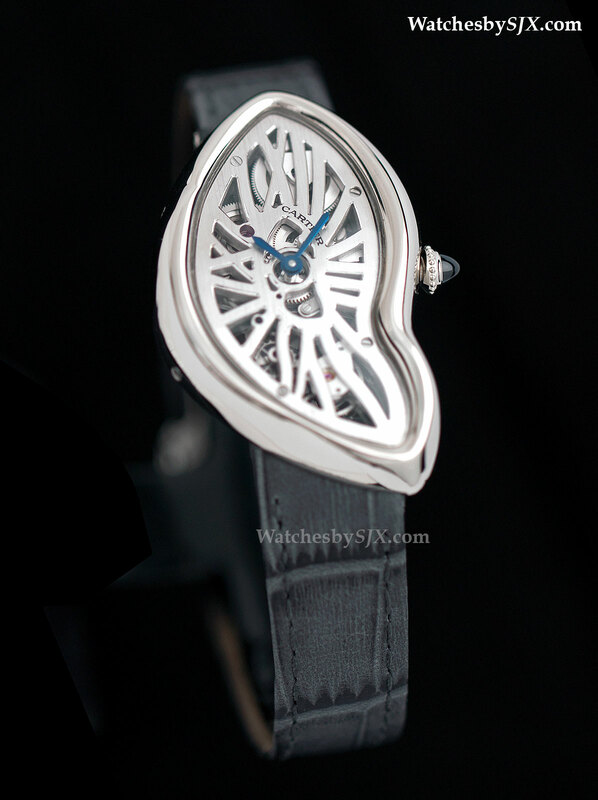 This will be an annual or biennial limited edition that reworks a notable form timepiece from Cartier’s vast archives.